You’d never know that these Vegan Chickpea Flour Chocolate Chip Cookies are not just vegan, but they are also gluten-free, grain-free, refined sugar-free and nut-free. They’re quite possibly the BEST gluten-free, vegan chocolate chip cookie EVER. Once upon a time, in a far away place (New Jersey), there was a girl who obtained a secret recipe from her father for the softest, chewiest chocolate chip cookies in all the land (still New Jersey). The girl shared her cookies with family and friends, and even once used them to get out of trouble with her college RA for having a bottle of wine in her dorm (for the record, she was 21). Everyone begged her for the recipe, but she kept it tight-lipped. Some even went as far to say they were better than the cookies from that famous brand with the yellow packaging. Then one day, the girl gave up refined sugar and wheat flour, and so…her days of cookie making were over…THE END. And that’s exactly what she did – change things up. First, she swapped white granulated sugar and brown sugar for coconut sugar. But flour, oh, that was a pesky little problem she had on her hands. So many gluten-free flours and yet none were quite right. She thought her prince would never come. And then, like a knight in shining armor, chickpea flour rode in on its steel horse (OK, fine it was a shopping cart) and saved the day! The chickpea flour produced a wheat-free cookie with a similar consistency to her signature recipe. It also provided a number of vitamins and minerals in addition to protein and fiber (You can check out all the awesome benefits of chickpea flour in this article). The chickpea fairy appeared out of nowhere and presented another magical ingredient that took this cookie to the NEXT LEVEL! “Now, what pray tell could that be?” the girl asked. “Why, aquafaba, my dear,” the chickpea fairy responded. In case you’re unfamiliar with aquafaba, it is the liquid found in a can of chickpeas and acts as an egg replacement in vegan baked goods. Sometimes, it is whipped, but other times (like in this case), it is used as is. And even though she used vegan butter rather than dairy-based butter, her new cookie still had that signature buttery taste. It even tasted BETTER than the original! And so, she lived happily ever after eating lots of Vegan Chickpea Flour Chocolate Chip Cookies at the Jersey Shore. Start by preheating your oven to 350°F and lining an extra large baking sheet with parchment paper. If you don’t have a large enough baking sheet, you can bake in two different batches. You just want to make sure the cookies are not too close to each other on the sheet. Next, add vegan butter, coconut sugar, aquafaba and vanilla extract in a large mixing bowl. Stir together using a spoon. In a separate bowl, combine chickpea flour, kosher salt, baking powder and baking soda. 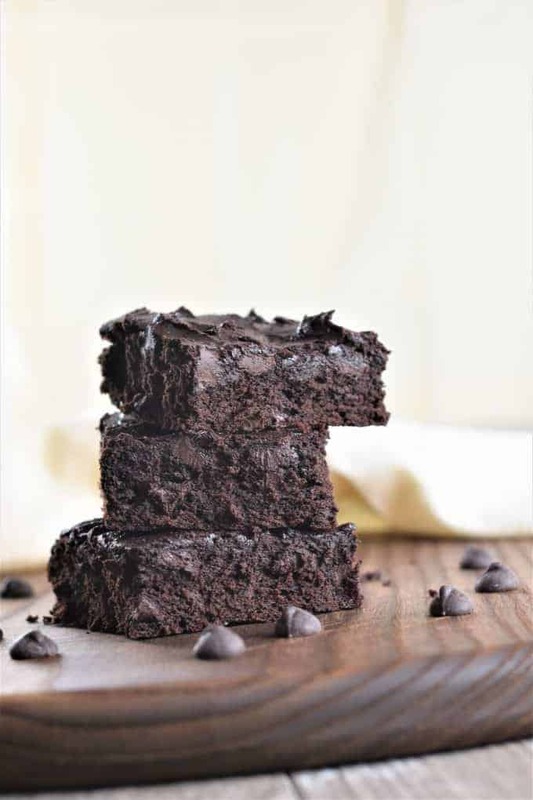 Be sure to use a grain-free baking powder to keep them grain-free, such as Pamela’s. You can also choose to omit the baking powder altogether and increase the amount of baking soda to elicit a similar result. Stir together with a spoon. Use a cookie scoop or your hands to create dough balls. Press down on each dough ball lightly with your fingers. Bake for 11-15 minutes until edges are light golden brown. At this point, you can top each cookie with sea salt right when they come out of the oven, if desired. You'd never know that these Vegan Chickpea Flour Chocolate Chip Cookies are not just vegan, but they are also gluten-free, grain-free, refined sugar-free and nut-free. They're quite possibly the BEST gluten-free, vegan chocolate chip cookie EVER. Preheat oven to 350°F and line an extra large baking sheet with parchment paper. If you do not have a baking sheet large enough, you can use two baking sheets and bake in two different batches. You just want to make sure the cookies are not too close to each other on the tray. Using a spoon, stir together vegan butter, coconut sugar, aquafaba and vanilla extract in a large mixing bowl. In a separate bowl, combine chickpea flour, kosher salt, baking powder and baking soda. 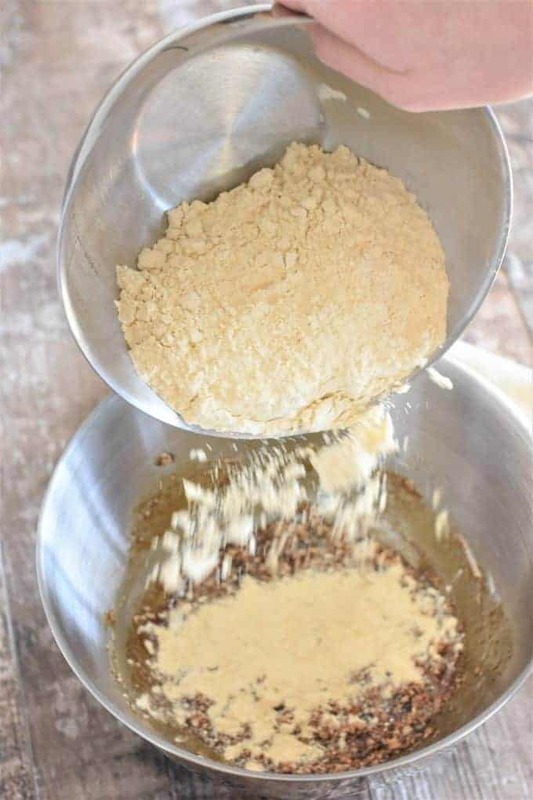 Add dry ingredients to wet ingredients and mix together with a spoon. Use a cookie scoop (I used a #40 disher) or your hands to create 15 dough balls. Press down each dough ball lightly with your fingers. Bake for 11-15 minutes (mine took 13 minutes). If you are baking in two batches, ensure the second tray is kept away from the heat of the oven until you take the first batch out. You can keep it in the refrigerator if desired. If you are using the optional sea salt, sprinkle sea salt to taste onto the baked cookies as soon as they come out of the oven. Cool on the baking sheet for 5 minutes to ensure the cookies are set. Then, use a flat spatula (turner) to transfer cookies to a cooling rack for 10 more minutes. If you cannot find grain-free baking powder or do not want to use it, you can omit the baking powder altogether and increase the baking soda to 1/2 teaspoon. This will elicit a similar result, but the texture of the cookies will be slightly different. Cookies taste best when stored in an airtight container at room temperature for up to 3 days. You can also refrigerate them to last a couple more days. Please note the nutrition calculation for this recipe does not include the optional sea salt, nor does it include the aquafaba since there is limited information regarding its nutritional composition. According to Aquafaba.com, aquafaba adds approximately 3-5 calories per tablespoon. We’ve been trying more gluten free food in our house, gotta give these a try! My bestie is vegan, I know she’ll love the surprise! I love how you have managed to make a yummy chocolate chip cook that is good for you as well. I have never cooked with chickpea flour and excited to try it. I love to make vegan desserts. These vegan chickpea flour chocolate chip cookies sound so delectable. I can’t wait to try this recipe! Im adding these to my vegan cookie file! I’m pinning and sharing. These cookies look amazing! I am going to have to try this chickpea flour. I have people that eat gluten-free in my office I am sure they love these cookies. I forgot to rate your recipe! Thanks so much, Stephanie! 🙂 Chickpea flour rocks…and not just for baking, but for cooking too. I think you’ll love it!